I love the Best Buy daily deals. Today I love love them. They are offering a Klipsch Wireless Speaker System for just $160 . This is 68% OFF the regular price and includes free shipping! Sync this bad boy up to your iPad, iPhone, or iPod (essentially anything with a lowercase 'i') and you'll be pumping mad beats throughout the neighborhood. 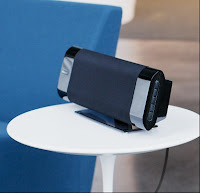 It's perfect for a living room or man cave where you can quickly switch your tunes from Air Supply to Metallica whenever you hear guests coming. Click here and scroll down to view the deal at Best Buy.